Are We Human Beings with Human Rights? If gay immigration rights existed in 2009, IVF siblings – a brother and sister would be growing up together. If rights for IVF children existed in 2013, the IVF siblings would be growing up together. Because the IVF sister is stranded in India, the IVF father is forced to live in EXILE in India and raise her with DIRECT consequence of NOT being able to participate in his elder IVF son’s life in the US. This is a LEGISLATIVE issue. We have been so VICTIMIZED that we are NOT even asking for EQUAL rights but just “some rights as humans”. Some days I wish I had NEVER heard of Gandhiji or his quotes but when I see my innocent, voiceless children, its worth it. Are these the effects of a dysfunctional intersex marriage? 1) Today LGBT marriage is being legalized in the US, immigration benefits among hundreds of other federal benefits like social security, welfare, married benefits, etc. are being provided to LGBT. a) Where is the immigration benefit for my princess like IVF daughter? Why is she STATELESS in 2013? What is the remedy? How can we move forward in life? b) Where are the hundreds of other benefits for my IVF daughter she would have had like being able to grow up with her IVF brother, enjoy the kisses and hugs between a brother and sister, be claimed as a dependent on taxes, getting social security, getting child support, etc. c) Why is my IVF son who waited three years to have a sibling being DENIED to see his sister, his father, his biological family? d) There are males who have fathered biological children in a heterosexual relationship and years later have come OUT as gay to their children. Have the biological mothers, the spouses of gays, been SEPARATED from their biological children? Have the biological SIBLINGS been SEPARATED from each other? If you can be gay and be proud, can you be IVF and be proud or is that the next “STIGMA” we have to overcome as a society? Its not about being gay or intersex or heterosexual, its about truth and love based on truth. 2) NIH is funding research on LGBTI health in 2013 for the FIRST time in history. a) Where were these resources in 2002 when a dysfunctional intersex family needed them? How did they survive with lack of resources OR help and support due to secrecy and lies? b) In 2013, UN Special Rapporteur on Torture called for a STOP on intersex surgeries. If its torture for an intersex person, what is it for a spouse caregiver of intersex forced into silence? 3) Are we WRONG to give human rights where laws itself fell short? Is it a one-way street when dealing with intersex and its effects on an immigrant family or are there other VICTIMS? a) Is it wrong to give human rights to an intersex person where highly learned, educated medical professionals fell short? b) Is it wrong to support an intersex marriage even though it is legally NOT recognized and laws fall short? c) Is it wrong to have an IVF child internationally and RAISE him as a primary care provider in silence while the medical treatment was ongoing for the intersex person? d) Is it wrong to want to give a sibling to the IVF son? Is it wrong to keep trying for three years despite several failed IVF attempts? Is there any trauma in dealing with infertility? e) Is it wrong to live in exile in India to raise the IVF daughter and take responsibility and accountability for her because she is NOT allowed to come to the US? Or should she have been abandoned or given up for adoption? f) Is it wrong to ask for our rights as a biological father, as a sister, as a brother to be UNITED for the FIRST time? Have we suffered and been victimized enough? (Young = inexperienced + Spouse Caregiver = Minority + Male caregiver = Minority within Minority) = NO RIGHTS + IVF Father = NO RIGHTS for IVF children -> WHY? Intersex surgery is very traumatic. Every imaginable change in a person – physically, mentally, emotionally, spiritually happens. While medical professionals can provide “academic” opinions and others can only imagine, having witnessed it and managing to stay alive, one can attest it is very traumatic. If there were NO sympathy, one would have left a long time ago, ask any family caregiver. If its very traumatic for the intersex person, what is it for the young, male, spouse caregiver of intersex suffering in silence? If the intersex person is a butterfly today, we have witnessed the ugly larvae stage and experienced the abuse and violence in silence. The parents of intersex (stereotyped as the caregiver of intersex) did not come to help AND due to secrecy and lies, we were not allowed any help or support, it was a closed door system. 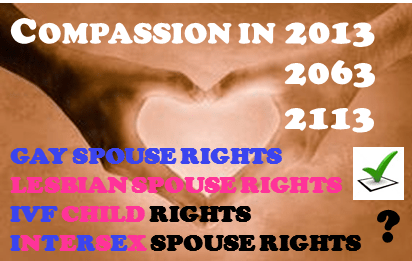 Are the spouse caregiver and his IVF children HUMAN BEINGS too? Its great that going forward LGBTI people will be able to legally marry, be able to legally immigrate, their children will be able to legally immigrate and be together as a family. We are being FORCED to live in the PAST because we are SEPARATED and have NO RELIEF as VICTIMS. Help us MOVE FORWARD. People like Edie Windsor, Tony Briffa are showing the way that the right path is truth and change the laws, do NOT break the laws. 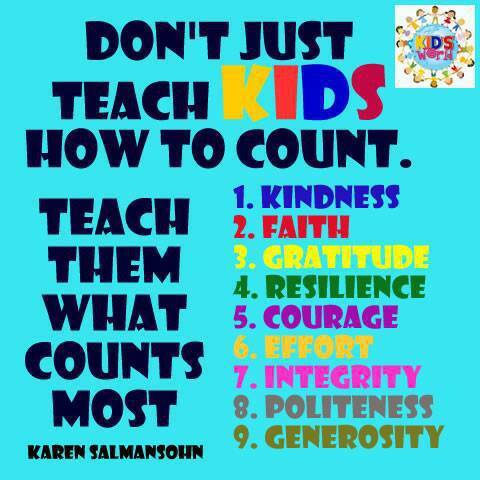 Thats what we want to teach our CHILDREN.